Discarding munitions in coastal waters and on the High Seas characterized a swift technique for clearing unwanted materials and challenging waste all over the world. In the years following WWII, there were almost no options to sea dumping and submerging to dispose of existing arsenals. But, the ocean is not an unlimited resource and it is “giving” our trash back. These munitions are washing up on beaches, getting snagged in fishing nets and leaching hazardous waste into our environment. At VRHabilis LLC, we are proud to be an integral part to the solution, that of Underwater Unexploded Ordnance (UXO) characterization and removal. Our Diver UXO Technicians are dually certified by the U.S. Navy or equivalent, to dive SCUBA and surface supplied, any time of the year, in handling UXO. We are capable, and own the equipment, for all kinds of diving and our experience allows us to select the best of each for every job. Safety, quality, forethought, planning, and attention to detail are our highest priorities. Because of our innovative modifications of underwater communication systems, when an anomaly is found, our experts and clients are able to see on a monitor what the diver sees and engage him in conversation to create the best solution for remediation. You have an emergency response situation? 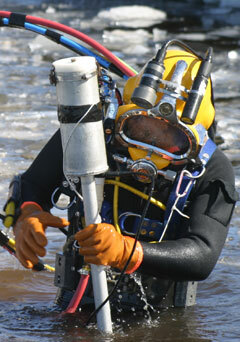 Just tell us where and when and we will mobilize our Emergency Dive Team to solve your problem. Fully certified and competent in HAZWOPER regulations, UXO characterization, removal, or demolition, our crew can handle any situation and arrive on the job site within 24 hours in the continental United States.